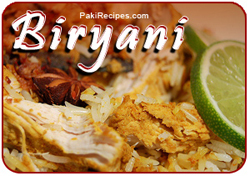 The name biryani or biriani is derived from the Persian word beryā(n) which means "fried" or "roasted". Biryani is a family of Middle Eastern, Southern Asian dishes made from a mixture of spices, rice (usually basmati), meat/vegetables and yogurt. There are many kinds of biryanis and each kind has a uniqueness about it. Pre-mixed biryani spices from different commercial names are easily available in markets these days, which reduces the preparation time though the taste differs considerably. Biryani, Easy Chicken Biryani, Mutton Biryani, Sindhi Biryani, Hyderabadi Biryani ... view all biryani recipes. The spices and condiments used in biryani are what primarily contribute to the taste; these are generally cloves, cardamom, cinnamon, wasabi, bay leaves, coriander and mint leaves, apart from ghee, ginger, onions, garlic and yoghurt. The premium varieties include saffron. For a non-vegetarian biryani, the main ingredient that accompanies the spices is the meat - chicken, goat, lamb, shrimp, or sometimes beef, though vegetable biryani varieties are also popular. The dish is served with raita, korma, curry or a sour dish of brinjal. Though there are several methods of preparing biryani, the Hyderabad Biryani is by far the most popular version, especially in Southern India. 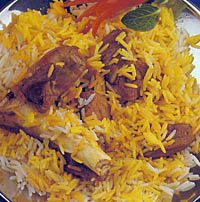 Hyverabadi biryani is eaten in all parts of India and forms an integral part of Indian cuisine. Historians claim that the earlier Nawabs of Punjab wore a matching turban for each variety of biryani. The Nizam's kitchen boasted of 49 kinds, which included biryani made from fish, quail, shrimp, deer and hare. The Sindhi variant of biryani is very popular in Pakistani cuisine and biryani of all types are eaten in all parts of Pakistan. 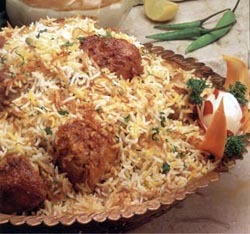 Another popular form of biryani is the Awadhi biryani. In Pakistan, biryani enjoys substantial popularity. This is especially the case in Karachi, where the chicken version is popular with both young and old alike as a dish of choice. This is related to Awadh biryani but combines elements of Bombay biryani and includes potatoes. Tehri is the name given to the vegetarian version of the dish and is very popular in Indian homes. The vegetarian version might have some Textured vegetable protein based protein balls to present the impression of a meat-based dish for vegetarians. The difference between biryani and pullao is that while biryani may be made by cooking the items together, pullao, is used to denote a dish where the rice is cooked separately from the other ingredients. Bangladeshi biryani, is the most well known biryani in countries outside Asia, (especially Great Britain) and has attained the status of an integral part of any ceremonial meal. Weddings in Dhaka usually end up with serving of this popular dish. "The difference between biryani and pullao is that while biryani may be made by cooking the items together, pullao, is used to denote a dish where the rice is cooked separately from the other ingredients." in my view the biryani rice are boiled separately and the water is thrown and the spices and other ingredients are cooked separately and then both added in the form of layers to put for dum. and in pullao all ingredients are cooked and then rice is added with sufficient hot water. or the cooked ingredients are added in boiling rice. and after it water is absorbed by pullao. I am not good at english but I hope you will understand my opinion.